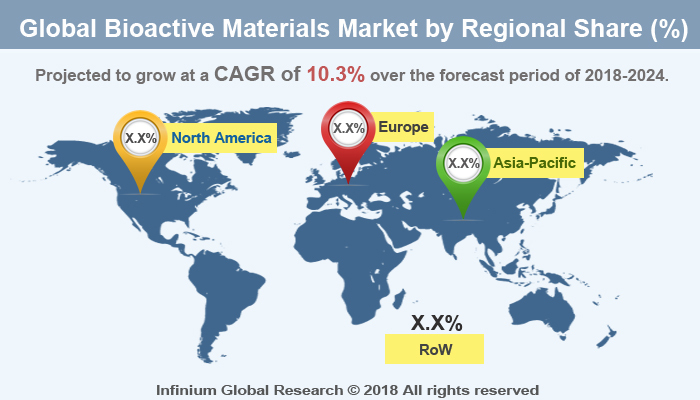 A recent report published by Infinium Global Research on bioactive materials market provides in-depth analysis of segments and sub-segments in the global as well as regional bioactive materials market. The study also highlights the impact of drivers, restraints and macro indicators on the global and regional bioactive materials market over the short term as well as long term. The report is a comprehensive presentation of trends, forecast and dollar values of global bioactive materials market. According to the report, the global bioactive materials market is projected to grow at a CAGR of 10.3% over the forecast period of 2018-2024. Bioactive materials are the material that is used to induce a response in the biological system by concentrating on the bio-inductive activity. The bioactive material is defined as a material that induces a response from living tissue, organisms or cell such as the formation of hydroxyapatite. They directly act on vital tissues and promotes tissue healing and repair and maintain pulp vitality. Bioactive materials have a combination of physicochemical properties so they are most suitable for the replacement of human body tissues and are biologically inert. The bioactive materials, including bioactive glasses, bioactive glass-ceramics, bioactive calcium phosphate ceramics, and bioactive composites. The bioactive materials are plays a significant role in the biomedical industry as it is used in the variety of applications including artificial organs, drug delivery systems, nano-medicine, bio-sensors, and many others. The growing demand of bioactive materials in the tissue replacement surgeries is strengthening the growth of bioactive materials across the globe. The Bioactive materials are increasingly used for bone and joint substitution and in the repair and regeneration of bone defects. In addition, rapidly growing healthcare industry and demand of advanced materials from the orthopedic sectors are likely to boost the growth of bioactive materials. The factors such as growing geriatric populations, rising organ failure, and replacement procedures and growing applications of bioactive materials in dental care & antibacterial products are anticipated to contribute to the growth of bioactive materials. However, the high cost of bioactive materials Confines the growth of bioactive materials market. Moreover, the ongoing technological innovations and the advancements in the bioactive materials are projected to create various growth opportunities in the bioactive materials market over the forecast period. Among the geographies, North America Prevail the market of bioactive materials followed by Europe. The developed healthcare infrastructure, high adoption of new healthcare technologies are the factors driving the growth of bioactive minerals market in the North America region. Furthermore, Asia Pacific is the fastest growing region in the bioactive materials market owing to the growing healthcare expenditure, and the growing geriatric population. The report on global bioactive materials market covers segments such as material types and application. On the basis of material types, the global bioactive materials market is categorized into glass, glass-ceramic, composite and others. On the basis of application the global bioactive materials market is categorized into surgery, dentistry, bio-engineering, and others. The countries covered in the North America region include the U.S., Canada, and Mexico; while the Asia-Pacific region includes countries such as China, Japan, India, South Korea, Malaysia, and among others. Moreover, Germany, U.K., France, Spain, and Rest of Europe are the major markets included in the European region. The U.S. drives the growth in the North America region, as it is the largest market in the region. In the Asia-pacific region, rapid industrial growth in India and China offer a substantial potential for the growth in the bioactive materials market. As a result, the APAC region is projected to experience a growth at a CAGR of x.x% over the forecast period. The report provides profiles of the companies in the global bioactive materials market such as Biomatlante, Arthrex Inc, Pulpdent Corporation, Bioactive Bone Substitutes Oy, Lasak s.r.o, Zimmer Holdings Inc, Medtronic Inc, Stryker Corporation, AAP implantate and DePuy Synthes. The report provides deep insights into demand forecasts, market trends, and micro and macro indicators. In addition, this report provides insights into the factors that are driving and restraining the global bioactive materials market. Moreover, IGR-Growth Matrix analysis given in the report brings an insight into the investment areas that existing or new market players can consider. The report provides insights into the market using analytical tools such as Porter's five forces analysis and DRO analysis of bioactive materials market. Moreover, the study highlights current market trends and provides forecast from 2018-2024. We also have highlighted future trends in the bioactive materials market that will impact the demand during the forecast period. Moreover, the competitive analysis given in each regional market brings an insight into the market share of the leading players. This report will help manufacturers, suppliers, and distributors of the bioactive materials market to understand the present and future trends in this market and formulate their strategies accordingly.